by Msgr. Michael J. Cantley, S.T.D. Every history begins with a prehistory, and parishes are no different. The territory that is served by St. Anastasia Parish is now located entirely within the confines of northeastern Queens, but once extended deeply into Nassau County. Before settlers appropriated this area for themselves it had been inhabited by a tribe of Indians called the Matinecock (a word meaning “hilly place”). Beginning in the early 17th Century white settlers began to occupy part of the western end of Long Island, the area we call home. At first, this European incursion was accepted and both settlers and Indians lived in peace. But by the middle of the Century the settlers grabbed more land and in doing so angered the Indians. War ensued, and the superior firepower of the settlers, along with weakening diseases that they brought to the native population that did not have the immunity of the Europeans, finally defeated the Matinecock and the tribe faded away. The area attracted many more settlers and the building of the North Shore Railroad serving western Queens as far as Flushing opened the area to larger numbers of inhabitants. Over the next few decades Little Neck – Douglaston experienced a significant increase in population. In the early years of the twentieth Century the Douglas Manor Association was formed and attracted some famous Hollywood personalities to live in the area. The opening of the Triborough Bridge in 1936 and the Bronx-Whitestone Bridge in 1939, making the area a kind of crossroads also made it desirable for the ease with which inhabitants could travel from and to Long Island Manhattan, Bronx and New England. Since the increasing population included many Catholics, the need for parishes to serve them became evident. 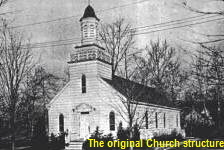 Before the founding of St. Anastasia’s in 1915, Catholics had to travel a considerable distance to St. Michael’s Church in Flushing (established in 1833), and later (after 1853) many traveled to St. Mary’s in Manhasset while some at a later time preferred St. Aloysius in Great Neck (established in 1876). When Sacred Heart was established in Bayside in 1891 the trek there became the more usual Sunday excursion for Mass. Petitions to Bishop Charles McDonnell (second Bishop of the Diocese from 1892-1921) were eventually granted and the Reverend Francis J. Uleau was appointed in October of 1915 to establish the new parish of St. Anastasia. There were only one hundred parishioners at the time of the founding, but they increased by three births and baptisms in the short tenure of Father Uleau. He was appointed pastor of St. Bartholomew’s in Elmhurst in March of 1916 and was succeeded by Father John Clark who led the congregation until 1922. Father Clark was successful in purchasing 20 lots along what was then called Harvard Avenue. This was the northern sector of the area that now accommodates the Church-School and Convent bounded by Northern Boulevard, 245th Street and Alameda Avenue. The first church building was a white wooden structure that could seat two hundred and it was built in 1918. The first Mass was celebrated in it on May 18, 1919. It cost $6,000. 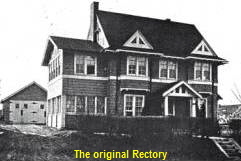 The first rectory was a house purchased by Father Clark. It had an interesting peregrine existence till its destruction in 1966. Originally located at 46-16 245th Street, in 1929 it was moved to the corner of 245th Street and Northern Boulevard, only to give room at a later date to the new convent. This caused the rectory to be moved to location further down Northern Boulevard (now the northwestern corner of the present school yard). In 1922, Father Clark was made pastor of St. Michael’s Church in Flushing and was succeeded by Father John Bohag who led the parish until 1945. The appointment was one of the first made by the new Bishop of Brooklyn, Thomas E. Molloy. Father Bohag inherited a debt for the Church and rectory that amounted to $12,000, which, with the generous contributions of the parishioners of St. Anastasia’s, he paid off in three years. In 1927 he began plans for a school and gymnasium/auditorium. These were completed by 1929 and the first administration and teaching staff were the Sisters of Mercy from Dallas, Pennsylvania. They were the principals (Sisters Mary Gonzales 1929-1930, Ruth 1930-1931, Andrew Hennigan 1931-1936, Constance 1936-1937, Andrew Hennigan 1937-1944, Adrian 1944-1949, Mary Virginia Reynolds 1949-1953, Assumpta Blaterrspiel 1953-1954, Andrew Hennigan 1954-1961, mary Virginai Reynolds 1961-1964, Assumpta Blaterrspiel 1964 – 1965, mary Agusta Moran 1965-1967, Mary Florita Maloney 1967 – 1984, Ailen Pervey 1984 – 1987.) and majority of faculty from 1929 until the late ’70s and throughout the ’80s, when the numbers of laity began to predominate. After 1987 the faculty became and remains lay. The first lay principal to be appointed was Miss. Jo Ann DiGangi 1987 – 1992. She, in turn, was succeeded in the office of principal by Mrs. Christina Teisch 1992 – 1997, and, at this writing, 2004, by Mrs. Jo Ann Dolan 1997 – Date. The school population at its largest enrolled over one thousand students in 1952 and would climb higher to reach sixteen hundred by 1966. There were in excess of nine thousand parishioners at that time. Currently and for the past decade the student population has hovered around three hundred and the parishioner population has also declined to what is now estimated to be about six thousand souls. Yet the quality of education given at St. Anastasia has remained excellent as is indicated by student scores on State mandated examinations, scores that exceed those of the other schools in the neighborhood, and the success of our students in entrance into the high schools of their choice. Children attending the public schools, and at the beginning of this history of St. Anastasia nearly all did, were and they still are, offered religious instruction and preparation for the Sacraments of Penance, Eucharist and Confirmation through formal classes at parish facilities, now the school building. 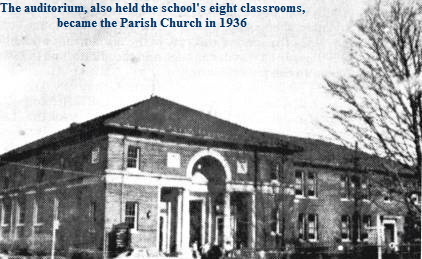 As early as 1922 Father Clark provided instruction for the fifty children of school age in the new parish. Bishop Molloy formally established the Confraternity of Christian Doctrine in the Diocese of Brooklyn in 1935 decreeing that it be canonically erected in every parish in 1936. Since then the CCD program has been a vital part of our parish. 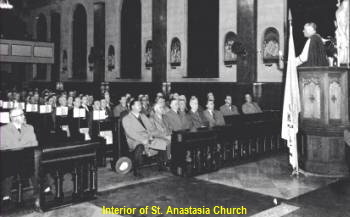 For many years use was made of the “released time” right that took a Supreme Court decision on April 28, 1952 to secure and children were released from the public schools they attended to come to St. Anastasia to be educated in their faith on Wednesday afternoons. The decision was acceptable to parents because it was accompanied by the assurance that no new material would be taught in the public schools while children of different faiths were at their churches for instruction. The Sisters in St. Anastasia’s School took charge and many participated in the teaching of the religion classes. There were also well-instructed lay volunteers from the beginning and two, Mrs. Marie Kurkowski and Mrs. Dorothy Hyland directed the program. Sister Ellen Brown, O.P and later Sister Esther Ann R.S.M. guided the program. Since the Sisters departed the parish, the program has been competently and effectively guided by Mrs. Florence Rose and now by Ms. Janine Kramer. The children of kindergarten age through the fourth grade are taught religion on Wednesday afternoons through the released time arrangement. Children in grades 5 through 8 have classes on Wednesday evenings. This arrangement seems to work exceedingly well and the teachers, again, are all well-instructed, competent and dedicated lay people, members of the parish. 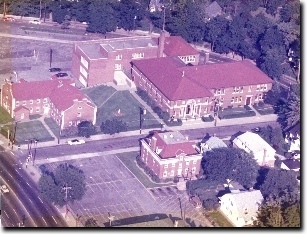 What was to have been the gymnasium/auditorium of the school replaced the little wooden Church to become the permanent Church for the parish in 1936. Over the last few years it has been redecorated and modified to comply with the liturgical directives of the Second Vatican Council (1962-1965) for a Church edifice and seems completely adequate for the present needs of the parish. The population is changing to some degree, with ethnic groups that are for the most part not Catholic. The Catholic parishioner population is graying. This is an area where housing is so expensive that most young families find it beyond their financial means. But in the early days of the parish, expansion seemed unlimited. To prepare for this growth, in 1928, Father Bohag purchased an additional eighteen lots on Alameda Avenue. The whole triangular block of land was secured for the parish to accommodate the Church-School-Convent. Father Bohag was transferred to pastor at St. Paul’s Church in Brooklyn in 1945 to be succeeded by Father George F. Helfenstein. 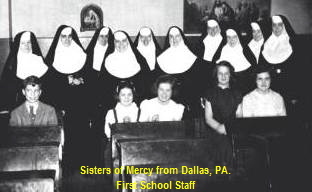 During his administration the Convent was built and dedicated in 1950 to house twenty sisters who would serve in the school. Until then the sisters had lived in quarters provided for them in the original school building. These former ‘convent quarters’ were converted into classrooms, a school hall and larger office space for the principal. The final addition to the school was added in 1957. Since then many interior modifications to the school have been made to accommodate new developments in education. It was also in 1950 that the first lay teachers were added to the faculty. No one, at that time could foresee that the laity would be the mainstay for the conduct of the school nearly forty years in the future, and that the convent would be a nearly empty building. The parish is fortunate to have the Sisters of St. Joseph of Brentwood to occupy the building. Though they work outside the parish, their presence keeps the image of Religious Life before us. A building on the southeast corner of 244th Street and Northern Boulevard was purchased in 1958 for multipurpose use. Remodeled in the present administration it is a useful and versatile building for small parties, meetings and as a home base for the Knights of Columbus, St. Anastasia Council 5911. It is called the Annex. Father Helfenstein retired in 1967 and was replaced in June of that year by Father William T. Smith who would serve until 1983 when the current pastor and author of these pages became pastor. But plans early in Father Helfenstein’s administration would both ease and make more difficult the administration of his immediate successor. In the late 1940s, Father Helfenstein had great dreams for the future and they involved the purchase of property and construction of buildings. An addition to the school and the Convent were first in importance. Then the present Rectory came to fruition. It was opened in 1967 and provided much-needed and comfortable living space for the priests of the parish and offices and meeting rooms for the parishioners. This final building completes the parish facilities as they now exist. However, there is an additional story of interest that completes the vision of Father Helfenstein. There was property on the north side of Northern Boulevard across from the convent building that he purchased, intending it for the construction of a high school. Fortunately, as things have developed, that project was stymied by a directive of Bishop Brian McEntegart (successor to Bishop Molloy in 1957), who placed a moratorium on such projects pending his own plans for a number of new Diocesan high schools. One of the last acts of Father Helfenstein was to pay off the rectory building debt with the last of the funds in reserve. This meant that Father Smith began his pastorate without reserves causing a financial headache that would not abate throughout his sixteen-year term until 1983. Only in the last year of his term did some relief appear on the horizon when the City of New York appropriated the vacant parish owned property for a “wild-life preserve”, the unkempt and overgrown plot across from the Rectory. The settlement was $750,000. Coming as it did at the end of Father Smith’s term, it was not possible for him to appeal the judgment that was obviously too little for the property in question His successor had his support in that appeal. Father Michael Cantley was installed as pastor in January 1983. When the new pastor came to the parish, he decided that this was not an acceptable settlement and hired a wonderful lawyer, Sidney Searles, to fight the issue in the Appeals Division of the State Courts. He won $1,375,000 for the parish. That was more like it! The million is still invested and the interest supports the school and helps to keep the tuition more modest than it would otherwise be. The three hundred and seventy-five thousand went to needed repair and renovation. Lots of other renewal projects and renovations have taken place over the past twenty-one years and they have been generously supported by parishioner contributions. Many of these contributions were made directly to the project being considered, for example the windows in the Church, the reredos with its light box window representations of the Crucifixion, and the air conditioning, and the vigil lights (all of which are recognized with dedication plaques). Similarly, the school has benefited with contributions to the renovation of the library (also recognized with dedication plaques or dedications in the front of newly purchased books). Other improvements like the multiple paintings of the Church, the new organ, the handicapped ramp, new windows in the school and many conversions of classrooms to accommodate a gymnasium, modern science and computer labs and a functional faculty room have been enabled by generous special contributions to fund drives and by the pay-back to the parish from annual Diocesan Bishop’s Appeal collections and the recent Alive-in-Hope campaign in the Diocese. The generosity of St. Anastasia parishioners is legendary and an indication of their concern for and support of their Church and School. At this writing, it is possible to say without qualification the parish and school are strong and can look to a solid future, assuming the same level of cooperation continues. Parishioner organizations have seen their day in many parishes and that unfortunate development has appeared in St. Anastasia a well. There was a very active Holy Name Society established in 1924. It was hundreds strong in active membership, but weak in the early 1980s to the point that it voted itself out of existence. 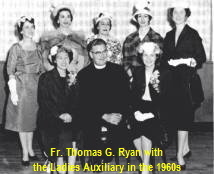 The Ladies Auxiliary was founded in 1953. It, too, was hundreds strong and continued into the early 1990s. During the World War II years, a First Friday Club came into existence with all-night vigils before the Blessed Sacrament exposed. It continued until the last years of the 1990s, but with constantly diminished numbers in attendance and only an hour of adoration after Mass on the First Fridays. While not specifically a parish organization, the Knights of Columbus, which has a Council in our parish that bears the parish name, is one of the last of the Catholic Societies still functioning in the parish. The majority of the members of the K of C are parishioners and they offer their services as ushers at Mass. The shrine to the unborn owes its existence to their concern. Yet, even this Council has reason to be concerned for its future as present members grow older and new recruits are slow to join. The parish makes its facilities available to the Leisure Club, and is reciprocally benefited with their active involvement in many parish functions. On the last Friday of each month, there is Mass in honor of Padre Pio, and each Friday the school building is used by the Croatian Community for cultural instruction of their young people. This is the time of the laity. Given the diminished numbers of priests, the laity will have a much more active role to play in the future of the Church world wide, nationally and diocesan-wide as well as in the local parishes. To perform their role efficiently and effectively, perhaps a renewal of former parish organizations should be considered, or new ones established to replace them and reorient parishioner energies to the works of the Church at the parish level. Canon Law mandates a finance committee, and we are fortunate to have such a committee augmented by parishioners who form an advisory council to aid the pastor in the decision making process. Beside parishioners who are experts in banking, law, accounting and construction, the committee also includes the trustees, school principal and Religious education directress along with the invaluable service offered by our parish finance secretary Mrs. Ann Larkin. Many of the laity came forward to serve liturgical functions and do so well and efficiently. For many years, dedicated married couples have participated in the preparation of those preparing to be married by offering them insights into marital life through the in-home Pre-Cana program. Lectors read at Mass and Eucharistic Ministers not only help with the service of Communion at Mass, they are also invaluable to bring the Eucharist to the homebound. The parish priests took over the chaplaincy of Deep Dale Hospital and were aided by the Eucharistic ministers. Even today, the priests of the parish celebrate Mass each Thursday at Little Neck Nursing Home, and Eucharistic Ministers help distribute the Eucharist on these occasions and also on Sundays. A generous group of volunteers count the collection each week, and prepare it for bank deposit. Young people, both girls and boys, serve at the altar and enhance the celebrations of the Liturgies, and a folk group enhances the Eucharistic celebrations by leading song at the 5:30 Mass on Saturday evenings. The Sunday liturgies have been skillfully led in song by Mrs. Delahunt as organist and Mr. Brian Donohue as cantor. The parish sponsors an active scouting program and Catholic Youth Organization (CYO) that, through the active support of adults, serve the social and sporting ambitions of the children who belong. These and the now defunct societies, or replacements for them, will be more necessary in the future. It should be noted that each parish is a corporation and the diocesan structure is called “corporation aggregate”. That means that while each parish is a separate legal entity, all are united in the diocesan structure. The bishop and vicar general are president and vice-president respectively of each parish corporation, the pastor is secretary-treasurer, and there are two lay trustees. To trace trustee membership all the way back would be cumbersome, so let me name the lay trustees since 1983, during my administration: Judge Robert Groh, Mr. John Blaha, Mr. James Flaherty, Sr., and now Mr. Ivan Starcic and Mr. Donald Harris. The trustees with a compliment of eight other parishioners who are lawyers, accountants, banker, businesspersons and educators are members of the finance-advisory committee. They are a valuable asset to advising the pastor and reviewing the workings of the parish. Father Uleau served less than a year at St. Anastasia and Father Clark served for six years, neither had an assistant priest and the limited number of parishioners did not require the assistance of additional priests. Father Bohag served twenty-three years. The first assistance he obtained was from Father James Cashman in 1925. In the following four years Fathers Walter Kiernan, George Dawson, Edward J. Mullaney Jerome Lynch and P. J. O’Connor served. In the 1930s and 1940s Fathers Henry Schultz, Eugene V. Kelly, John Swanson, Walter J. Smith, Edward F. Pfundstein, Thomas G. Ryan and Edward Nedd joined the parish, most as replacements for the earlier appointments. The Pastor and four Associates were the full compliment on the priestly staff at any one time. During Father Helfenstein’s administration of twenty-two years, Fathers Raymond McKiernan, Thomas Flanagan, John Jurgensen, Joseph Parks, Bartholomew Keohane and John J. Gribbon were added to the list of assisting priests. Father Gribbon probably holds the Diocesan record for assignment longevity, 36 years to date and still counting. Father Smith was pastor for sixteen years during which time Fathers Kenneth Vetter, Joseph Byrns, Ronald Petroski, William McCarren, Matteo Rizzo and Thomas Murtagh came to serve. The recently deceased Father Murtagh is notable in the annals of the parish for having served here as a deacon for a year and then being ordained in our Church by Bishop Mugavero on June 6, 1981. The current pastor welcomed Fathers Brian Keller, Joseph Grisaitis, George Lutjen (fortunately still with us at this writing) and Francis Mann. There is an adage “what goes around comes around”. We can only hope that it will not become the literal truth for our parish or for the Diocese. The history of St. Anastasia began with one priest, the pastor, ministering to its needs. This situation may in the near future, given the diminished availability of priests in out diocese. The difference will, however, be significant since the number of parishioners is larger by far than at the beginning of our history. At this writing St. Anastasia is served by three septuagenarians aged 77, 73, and 71. Father Gribbon is retired, though he helps to the degree he can, and in June I will be retired. A new pastor will be appointed, and the parish will continue to be served by only two assigned priests. 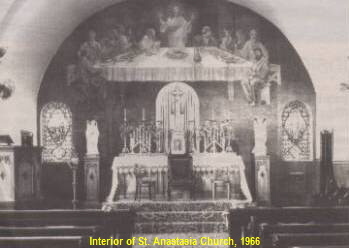 My own residence has not yet been established, so I cannot promise to continue to serve here, unless, of course, I am permitted to continue to reside at St. Anastasia. Services have been somewhat curtailed, for example the weekday Masses are reduced from three to two and the weekend Masses from twelve to seven. This does not seem to have impacted on parishioners too severely at this time. But the ‘gray reaper’ will someday step in. Replacements will happen. But the priesthood is not attracting candidates in sufficient numbers to suggest the possibility of a return to the ‘halcyon days of yesteryear’. Never before has it been so necessary to pray for vocations as we must today, and pray with the willingness to have them arise within our own families. The most recent statistics look for only one or two to be ordained in each of the next ten years, and 164 will be eligible for retirement. The Diocese is forming a “clustering” of parishes to assure the delivery of services and at the same time to limit the reduplication where possible. Our “cluster” comprises Our Lady of the Blessed Sacrament, Sacred Heart, St. Josaphat, St. Robert Bellarmine and St. Anastasia. Information about services and Mass times will be shared to enable all in our area to be apprised of what will be available to meet their spiritual needs. It is a time when we must all, clergy and laity take an interest in the service of the spiritual needs of everyone. History is never complete, it is always an ongoing project and we are the ones who make history. What has been reported here is only the surface of a very rich history that has already been accomplished. The people who have made this history, those who have gone before us and we too are the firm foundation for the future, a history that has yet to be written. May the Lord Who has blessed us so richly continue to do so, and may we be as compliant with His grace as past history has been. Msgr. Michael J. Cantley, S.T.D. Msgr. George J. Ryan, S.T.L., M.A. Rev. Msgr. Anthony F. Sherman, S.T.L.